A riot stopped play in an Africa Cup of Nations qualifier on Sunday as fans threw missiles and police fired tear gas into the stands. The unrest broke out when a goal was awarded to Guinea Bissau after 81 minutes, with Kenya's players arguing the ball had not crossed the line. 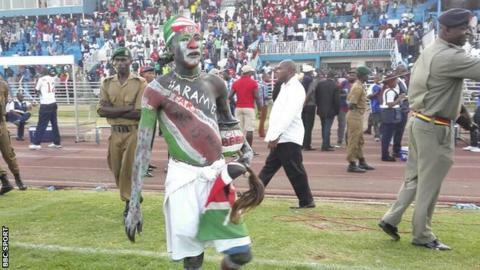 Play was halted for 30 minutes as Kenya fans threw missiles at the Guinea Bissau bench and the fourth official. Kenya, who were beaten 1-0 in Nairobi, could face sanctions. The result takes Guinea Bissau to the top of their qualifying group and leaves Kenya with little chance of qualifying for next year's tournament. Elsewhere in Group E, Congo and Zambia drew 1-1 in an identical scoreline to their result in Ndola on Wednesday. Jordan Massengo put Congo ahead in Brazzaville just after half-time, with Winston Kalengo equalising in the 72nd minute. Guinea Bissau lead the group on seven points, one point ahead of both Congo and Zambia, with Kenya bottom, six points off the top. In Sunday's first Nations Cup qualifier, Ghana lost their 100% record in Group H with a 0-0 draw in Mozambique. The result in Maputo leaves the Black Stars on 10 points, four ahead of Mauritius, the surprise package in Group H. Mauritius could close that gap with a win over Rwanda in Kigali on Tuesday. West Bromwich Albion's Stephane Sessegnon scored twice for Benin in Cotonou as the hosts beat South Sudan 4-1 to go top of Group C.
Mickael Pote and Jodel Dossou were also on target for Benin, with Atak Lual grabbing a consolation for the away side. Mali could regain the lead in that group if they beat Equatorial Guinea in Malabo on Monday. Comoros, who got their first win in a major qualifying competition when they beat Botswana at home on Thursday, were brought back down to earth with a 2-1 defeat in the return fixture. Comoros looked like they might complete a double over their opponents when Mchangama Youssouf scored just before the break. But second-half goals from Galabgwe Moyana and then Joel Mogorosi gave Botswana the win which puts them level on points with the top two, Uganda and Burkina Faso, who play each other in Kampala on Tuesday. All group winners are guaranteed places at the 2017 tournament in Gabon, with the best two runners-up joining them.